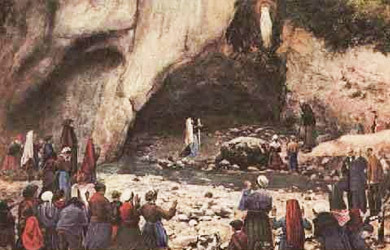 The message of Lourdes as given by Our Lady The ‘Message of Lourdes’ is the words and actions that were exchanged between the Virgin Mary and Bernadette at the Grotto of Massabielle during the eighteen apparitions from 11th February 1858 to 16th July 1858. To understand the events which took place and the ‘Message of Lourdes’ it is necessary to know the context of the Apparitions that Bernadette experienced. The First Apparition On 11th February 1858 Bernadette, her sister Toinette and a friend of theirs, Jeanne, went looking for wood on the meadows. They went towards “the place where the canal rejoins the River Gave”. They were in front of the Cave of Massabielle. Toinette and Jeanne crossed the icy water crying out with the cold; Bernadette hesitated to do this because of her chronic asthma. She heard “a noise like a gust of wind”, but “none of the trees were moving”. “Raising her head, she saw, in a hollow of the rock a small young lady, who looked at her and who smiled at her. This was the first Apparition of the Virgin Mary. What God wishes to accomplish in each of us At the time of Bernadette, the Grotto was a dirty, hidden, damp and cold place. The Grotto was called the ‘pigs’ shelter’ because that was where the pigs feeding in the area usually took shelter. It was there that the Virgin Mary, dressed in white, a sign of total purity, the sign of the Love of God, in other words, the sign of what God wishes to accomplish in each of us, deigned to appear. There is a contrast between this damp and obscure Grotto and the presence of the Virgin Mary , ‘the Immaculate Conception’. It reminds us of the Gospel: the meeting of the wealth of the goodness of God and the poverty of the human person. ‘Jesus goes to sit at the table of sinners’, ‘because he came to search out that which was lost’. This is why he comes to share our meal, in other words, our life. 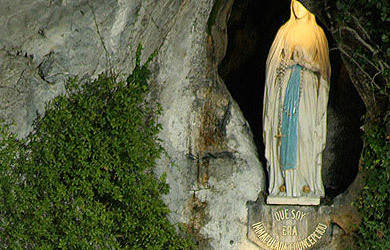 A place where God gives us a sign At Lourdes, the fact that Mary had appeared in a dirty and obscure Grotto, in the place called Massabielle, the Old Rock, tells us that God comes to join us where we are, in the midst of our poverty and failures. 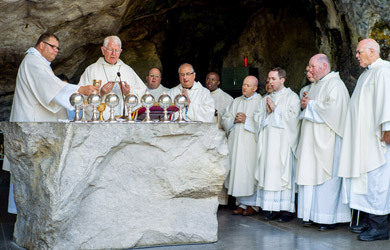 The Grotto is not only a place where something happened – a geographical place – it is also a place where God gives us a sign by revealing his heart and our heart. It is a place where God leaves us a message, a message that is nothing other than that of the Gospel. God comes to tell us that he loves us, – this is the heart of the Message of Lourdes, and he loves us as we are with all our successes but also with all our wounds, our weaknesses and our limitations. A relationship that is of the order of love During the third Apparition on 18th February, The Virgin Mary spoke for the first time. Bernadette held out a sheet of paper and a pencil so that she might write down her name, but the Lady replied: ‘what I have to say to you does not have to be written down’. This was an extraordinary statement. It meant that the Virgin Mary wanted to enter into a relationship that is of the order of love, at the level of the heart. The heart, in the Bible, signifies the very centre of the person, that which is the depth of the person. Bernadette was right away invited to open the depths of her heart to this Message of Love. We are all worthy in the eyes of God At the second statement of the Virgin Mary: “Would you do me the kindness of coming here for fifteen days?” Bernadette was overwhelmed. It was the first time that anyone had addressed her in a formal way. Bernadette describes these words by saying that the Virgin looked at her ‘as one person looks at another person’. Human beings, created in the image and likeness of God, are persons. Bernadette felt that she was also respected and loved, she also had the experience of being a person. We are all worthy of our dignity in the eyes of God. Because each of us is loved by God. To discover, here below, ‘another world’ The third statement of the Virgin was: “I do not promise to make you happy in this world but in the other”. We know a world of violence, lies, sensuality, profit and war. But we know also a world of charity, solidarity and justice. These two worlds exist on our earth. When Jesus, in the Gospel, invites us to discover the Kingdom of Heaven, he invites us to discover in our world, as it is, “another world”. Wherever love exists, God is present. To experience God is nothing other than to experience love in this world. To whoever knows how to discover this, Jesus makes the following promise: “You are not far from the Kingdom of God.” That is: “you have known how to discover here below this Kingdom and you have lived out your life in this Love”. This is the promise of the Virgin Mary to Bernadette. “I promise that you will discover here below another world”. And, in spite of her poverty, her illness and her lack of education, Bernadette is always deeply happy. That is the Kingdom of God, the world of real Love. Incomprehensible actions During the seven first Apparitions of the Virgin Mary, Bernadette has a face radiant with joy, happiness and light. Between the eighth and twelfth Apparitions all changed: the face of Bernadette became hard, sad and sorrowful, and moreover, Bernadette does incomprehensible things. She moves on her knees to the back of the Grotto. She kisses the dirty disgusting ground of the Grotto. She eats some bitter grass. She scrapes the ground three times trying to drink the muddy water, at the back of the Grotto, she tries sucking in a little and then throwing it away, she takes mud in her hands and she smears her face. Then the young girl turns to the crowd with her hands apart. They all say: “She’s mad!” During four Apparitions, she carried out the same actions. What is happening? Nobody understands! 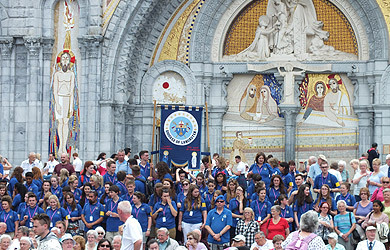 We are at the heart of the Message of Lourdes. …but biblical These actions are biblical actions. Because ‘the Lady’ asked her, Bernadette acts out the Incarnation, the Passion and the death of Christ; Moving on her knees at the back of the Grotto: this action recalls the Incarnation, God lowers himself to become human. Bernadette kisses the ground showing us that this act of humility is an action of the love God has for his people. Eating bitter grass at the back of the Grotto: when the Jews in the Old Testament wanted to show that God had taken on himself all the bitterness and all the sins of the world, they killed a lamb, cleaned it out and filled it with bitter herbs and then made the following prayer over the lamb “This is the Lamb of God who takes away, who takes on himself, all the bitterness and all the sins of the world.” Smearing her face with mud: when the prophet Isaiah wanted to speak to us about the Messiah, he called him “the suffering servant”. “Because he carried on himself all our sins his face no longer appeared human. “He was” Isaiah specifies, “like a lamb led to the slaughter, and on his way the crowd mocked him”. At the Grotto, mud disfigures Bernadette and the crowd cries out, “She has gone mad”. A flowing spring The actions that Bernadette carried out were the actions of freeing something. The Grotto was choked with grass and mud. But why does she free this Grotto? Because it hides an immense treasure, which must be brought out into the open. Thus, at the ninth Apparition, ‘the Lady’ asked Bernadette to scrape the ground, at the back of this ‘pigs’ shelter’, saying to her; “Go to the spring, drink of it and wash yourself there”. There is only a little muddy water to begin with, enough for Bernadette to drink. At first, this water is muddy and dirty then, little by little, it becomes clear. By these actions, the mystery of the heart of Jesus is revealed for us: “ A soldier pierced his heart with his lance and there immediately flowed out blood and water.” It is, as well, the depths of the mystery of the heart of the human person, created in the image and likeness of God: ‘The water that I shall give you will become, in you, a spring welling up to eternal life’. The grass and the mud signify the human heart, wounded by sin. But in the bottom of this heart, there is the life of God, as signified by the spring. Bernadette was asked, “Did the Lady say something to you?” She replied “Yes, now and again she would say, ‘Penance, penance, penance, pray for sinners’.” By penance, we understand conversion. Conversion in the Church, as we learn from Christ, involves turning our heart towards God and towards others. ‘Pray for sinners’. Praying brings us to the Spirit of God. Thus we understand that sin does not make us happy. We must understand that sin is something that is contrary to the love of God that is revealed to us through the Gospel. Go towards others and build a church During the thirteenth apparition Our Lady said to Bernadette, “Go, tell the priests to come here in procession and build a chapel here”. ‘Come here in procession’ means always moving, in this life, towards others.‘Build a chapel here.’ In Lourdes, chapels were built to receive the crowds that came here. But these chapels are only the signs of the communion based on the love to which we are called. The chapel is the ‘Church’ that we want to build where we are, in our family, at our place of work, in our parish, in our diocese. All Christians spend their lives building the Church, living in communion with others. “I am the Immaculate Conception” On 25th March 1858, the day of the sixteenth apparition, Bernadette went to the Grotto, and on the instigation of the Parish Priest, Fr. Peyramale, asked the Lady for her name. Three times Bernadette asked the question. On the fourth request, the Lady responds in dialect “Que soy era lmmaculada Conceptiou”. (“I am the Immaculate Conception”). Bernadette does not understand immediately the meaning of these words. She goes to the Parish Priest to tell him the Lady’s name. 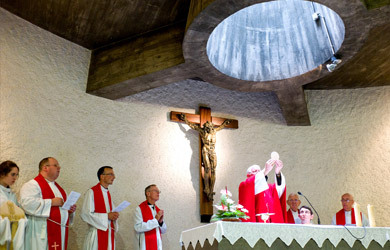 He understands that it is the Mother of God who has appeared at the Grotto of Massabielle. Later the Bishop of Tarbes, Monseigneur Laurence, confirms this.The Dogma of the Immaculate Conception is, as the Church teaches, ‘Mary, conceived without sin, thanks to the merits of the Cross of Christ’. Thus, the Immaculate Conception is also the sign of what all people, recreated by God, are called to be.